Saw the Vision of the world and all the wonder that would be." In the hearing room of the United States House of Representatives Committee on Science, Space and Technology, the wall bears an inscription of the above quote from the English poet Alfred Lord Tennyson. 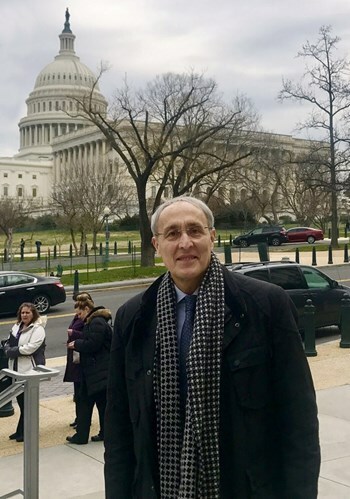 It set a fitting context for much of the discussion as the Subcommittee on Energy met on 6 March to discuss the future of the US fusion research program, including US participation in the ITER Project. Director-General Bigot has appeared twice before the Science, Space and Technology Subcommittee on Energy of the US House of Representatives (April 2016 and March 2018). This time, the focus was on the future of the US fusion research program. As the Washington Post reported the next day, the hearing was striking for its clear bipartisan support for ITER and the benefits of US participation. One after another, Republicans and Democrats noted the importance of fusion as part of a future global energy supply, and the corresponding importance of ITER as a core element of the US fusion research program (just as ITER is a core element of fusion research for each Member). As stated by the Republican Chairman of the Subcommittee, Representative Randy Weber, "Though located in France, ITER is also a US research project." A particular topic of discussion was the ongoing shortfalls in the US budget contributions to ITER. Chairman Weber noted that the 2019 budget of $75 million proposed by the US Administration is "well below the amount needed to keep the project on track." His counterpart at the hearing, Democratic Representative Zoe Lofgren, added her concern, listing by name the other ITER Members and declaring, "We cannot afford to lose our seat at this table." These sentiments were echoed by the Chairman of the Full Committee, Republican Representative Lamar Smith, who also chose to attend the hearing. "Reducing annual funding will only delay ITER instruments being built here in the United States," he stated, "and cause construction delays that increase overall project cost." ITER Director-General Bernard Bigot's testimony also emphasized the budgetary risks facing the project. "A shortfall in the contribution of any single member, if it impacts the delivery of components or the capacity of ITER to meet the assembly and installation schedule, will have a cascading effect in delays, costs, and the disruption of fusion research for every other member." Most of the Director-General's message, however, focused on positive signs: the strong pace of progress in construction and manufacturing, the repeated validation through external review and audit that ITER is "well managed to the best industry standards," and the overall Member contributions that have led to ITER recently crossing the 50 percent mark in "total construction work scope through First Plasma." Bigot's statements about progress were well aligned with the praise for the project that was given by many of the Congressional representatives present. Chairman Smith specifically thanked the ITER Director-General for "his leadership of this complex and challenging international research project." Also of note was the commendation from Republican Representative Frank Lucas—the only Congressional leader present who had physically visited the ITER worksite, in October 2015. Representative Lucas called the progress of the intervening years "impressive," and was among the most outspoken Committee members on the need for the United States. to meet its commitments and take full advantage of its status as an ITER Member. In addition to Director-General Bigot, Congressional leaders heard from: James W. Van Dam, acting Associate Director of Fusion Energy Sciences in the Department of Energy's Office of Science; Mickey Wade, Director of Advanced Fusion Systems in the Magnetic Fusion Energy Division of General Atomics; and Mark Herrmann, Director of the National Ignition Facility at Lawrence Livermore National Laboratory. Each member of the panel spoke supportively of ITER. At the conclusion of his statement, Wade gave the Committee two recommendations: that the US should make a firm commitment to fully fund ITER; and that the US should move now to establish a comprehensive strategic plan that seeks to capitalize on ITER's success. During his short time in Washington, Director-General Bigot also held meetings with the Undersecretary for Science at the Department of Energy, Paul Dabbar; with representatives of four bureaus of the State Department; and with a number of officials from the White House Office of Science and Technology Policy, including those involved with the Nuclear Energy Policy Review—a review that, among other topics, is examining US participation in ITER. The ITER Director-General says that he left those meetings with concern (as long as a final decision is not taken) but also with hope. "It is clear that the status of US contributions is becoming urgent for ITER," he said. "But it is also clear that US officials are giving the situation their full attention. They are keenly aware of the important role ITER plays as an essential part of the US fusion program. I continue to feel optimistic that we will see a positive decision in the near future." The two-hour long hearing, "The Future of U.S. Fusion Energy Research," can be viewed here, together with the written version of opening statements made by Committee Chairman Lamar Smith and Subcommittee Chairman Randy Weber.